This endearing and beautiful book published by Stewart, Tabori & Chang is choc-a-block full of cute, cuddly canine photographs. 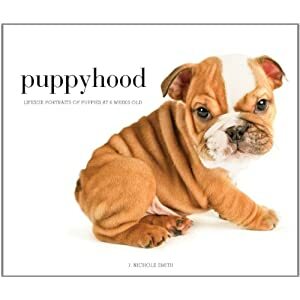 You will fall in love with Moe, the Yorkipoo with the little speckled muzzle, Tater Tot, the disproportionately large pawed Great Dane, as well as Chad, Roland, and ... well... every little guy in the whole book. Next stop? The Humane Society. So maybe you can’t get a new puppy at the moment, but there’s a chance you still may end up coming home with sixty furry new friends. Luckily, these little monsters are remarkably apartment friendly in non-fiction format. In order to satiate your puppy love until then, check out this book trailer that is sure to give you the warm and fuzzies: http://youtu.be/eQ4zui-BPJw. Hopefully Abby, our resident Manda pooch, doesn’t get jealous!